Belper United boss David Moon heaped praise on his players after reaching the semi-final stage of the EMCL League Cup. The Green Army secured their place in the last four of the competition with a 3-1 midweek win over Eastwood Community FC. Tim Adcock made the breakthrough for Belper on 28 minutes before Adam Dring made it two 10 minutes later. Eastwood pulled a goal back just shy of half time but Belper made sure they advanced with Adcock’s second late on. Moon said: “The performance and attitude from start to finish was superb. “We could have had four or five goals in the first half alone but in the second half when Eastwood were putting pressure on us, and piling players forward, we were organised and frustrated them, in which we got the third goal late on to give us some breathing space. The Green Army took their time to settle into game and after Eastwood’s bright start they had the first shot which sailed over the bar. Belper’s first attempt on goal came through Ben Gowing’s low driven shot, saved by the Eastwood keeper. Dring, who was becoming more of a threat for Belper, narrowly headed wide from a corner taken by Tom Rushby. 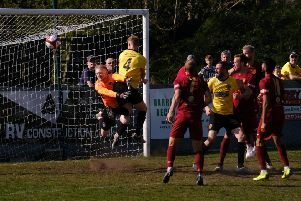 Ryan Baker’s shot from distance tested the young Eastwood keeper who pushed to safety. Belper’s momentum was growing and on 28 minutes they took the lead from the dangerous and tricky Adcock, who shot low and hard into the bottom left corner. A double save from the Eastwood keeper couldn’t keep Belper out as the ball dropped for Dring who buried it. Eastwood got a goal back just before half time after a long ball was put into the box which wasn’t dealt with, Rory Smith tucking it home. Tom Rushby’s 25-yard driven shot was pushed onto the post by the fully stretched Eastwood keeper on 55 minutes. It was finally won on 85 minutes through a counter-attack when the ball fell to Adcock inside the box. The tricky midfielder scored his second of the game to wrap things up.